I liked the packaging and particularly, the satisfying "click" when you use the pump. However, the downside is that it's not a see-through bottle which I'd have preferred in order to see how much of the product is remaining. 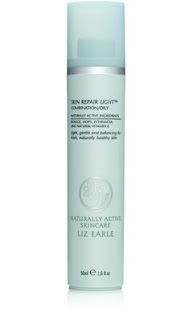 The product itself is easy to use and lives up to the Light description (there's another Skin Repair Moisturiser for Combination/ Oily skin which isn't described as Light and is presented in a tub). In fact, I found it too light, even for my oily skin and had to reapply after 15 minutes- unheard of! I wasn't too sure about the scent as I tend to associate fragrance with reactions to products, although I didn't experience any myself. I would recommend this product, however, I think that at £17.60 for 50ml it's a little on the pricey side. As natural skincare isn't something I personally place a great deal of importance upon, I'd probably spend no more than £15 on this.